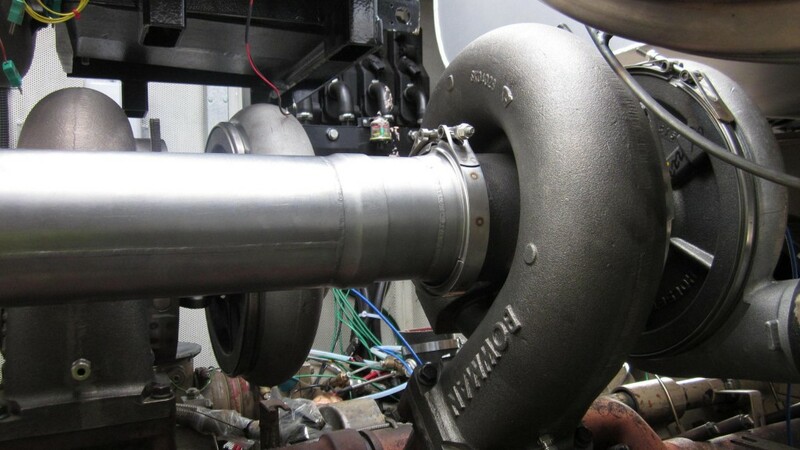 Bowman Power Group Ltd has conducted emissions trials on a gas fuelled generator to investigate the effect of using its Electric Turbo Compounding (ETC) technology on unburnt hydrocarbon (UHC) emissions. Initial findings indicate a 25-50% reduction in UHC emissions, in addition to the previously proven benefits in respect of improved engine efficiency and reductions in CO2 emissions. This was achieved by reducing the scavenging pressure in the engine cylinders, almost entirely eliminating fuel short circuiting and also reducing the release of non-combusted fuel. More information on the specifics of how this was achieved is available on request or directly at Bowman's website. To achieve this level of reduction would typically require long research and development periods for ‘in-engine' solutions by an original equipment manufacturer, followed by intrusive and costly engine modification. Bowman's ETC system does away with this requirement, reducing costs and increasing the speed of upgrading the engine. Reducing emissions continues to be the most significant element of the global climate change agenda, from the National Emission Ceilings Directive; to the Medium Combustion Plant Directive; the forthcoming TA Luft in Germany and other provisions on the horizon. The rise in the use of gas fuelled generators has led to a rise in UHC emissions, including methane which has a greenhouse gas effect 25-100 times that of CO2. This has led to the need for tighter UHC emissions regulations which are now on the horizon. In anticipation of this legislation, and in line with their objective to making gas and diesel generators work more efficiently and environmentally, Bowman has continued to evolve its understanding of how its ETC technology interacts with the engines and generators it's installed on. The benefits of recovering waste heat energy from the exhaust gas and converting it to free, grid-quality electrical power are well understood, but the company is now well progressed with understanding this additional benefit of reduced emissions of harmful greenhouse gases. With the flagship ETC 1000 system, end-users can still maintain the same power output using less fuel and producing fewer CO2 emissions, or produce additional power with improved fuel efficiency, and they can now do this knowing that the effect of operating their engines or generators on overall greenhouse gas emissions is much reduced. Bowman's ETC on a containerized genset. This ability to cut UHC emissions has been initially demonstrated with a recent installation with a UK waste to energy company, where a reduction of 32% (from 1100 to 750ppm) was observed. This equates to a reduction in greenhouse gas emissions for this specific application of 12%, when taking both the direct reduction in CO2 emissions from the fuel savings (~5%) and reduction in CH4 emissions into account. This builds on Bowman's existing track record of reducing CO2 emissions in generators, having already reduced carbon emissions by over 300,000 tonnes as a direct result of fuel consumption improvements. It is estimated that when methane emissions are included the ETC system can achieve an 8 - 23% reduction in greenhouse emissions of gas fuelled engines/generators over a 20-year time horizon. The company is planning further tests and demonstrations of this important finding during 2019. Paul Dowman-Tucker, CEO of Bowman, commented, "The global energy mix needs to be greener and more energy efficient. From day one that's what we have set out to do with our ETC technology, enabling more efficient and cleaner operations with fossil fuels where it is necessary to use them. These latest results are truly exciting and, coupled with our existing strong track record for reducing CO2 emissions, really cement our commitment to this goal." "This achievement is yet further indication of how unique the ETC system is," said Keith Douglas, Head of Performance Engineering at Bowman. "We are not aware of any other technology that can be fitted to an engine to significantly reduce unburnt hydrocarbons, whilst improving fuel consumption." BioHiTech Global initiates operations at first HEBioT SRF facility in U.S.
BioHiTech Global, Inc. has initiated operations at the first HEBioT renewable resource recovery facility in the U.S., located in Martinsburg, West Virginia. BioHiTech has successfully completed the first phase of plant commissioning including the facility's reception area, overhead bridge cranes, and its primary mechanical sorting equipment. The company has begun the next phase of plant commissioning and progressing operations, which includes receiving limited amounts of waste and beginning runs of its HEBioT Process, a patented high efficiency mechanical and biological treatment process for producing an EPA recognized solid recovered fuel (SRF). A newly developed system by Eggersmann for drying of Municipal Solid Waste is being put into service for the first time at a Mechanical- Biological Waste Treatment plant (MBT) in Iraq. Contracts were signed with the client, the Faruk Group, in December 2018 at Suleymaniyah, Iraq. As per a recent industry report put forward by Global Market Insights Inc., the global Waste to Energy Market is forecast to register its name in the billion-dollar fraternity down the line of six years, by exceeding a revenue of USD 35.5 billion by 2024 with a projected CAGR of 6.5% over 2018-2024. The X-Cutter (XC) system for the XR waste shredder was first revealed by UNTHA Shredding Technology at the IFAT event in Munich, this past May. Designed to achieve the next generation of performance for single-step SRF shredding - or provide a direct replacement for existing high-speed shredders - it can transform varied input wastes ranging from waste wood through to pulper ropes. BioHiTech Global, Inc., a technology and services company that provides cost-effective and sustainable waste management solutions, recently announced that the Company's subsidiary, Rensselaer Resource Recovery, LLC, has received local permit approval from the City of Rensselaer New York to build a 72,000 square foot HEBioT municipal waste processing facility on 23 acres of land in the city's southern industrial area. BioMass Solution LLC has begun construction of the Red River BioRefinery located in Grand Forks, North Dakota. The facility will convert over 500,000 tons per year agricultural waste and by-products in to advanced biofuels, to be sold in the transportation fuels marketplace. Commercial operations are scheduled to begin in early 2020. Enerkem Inc. , the waste-to-biofuels and chemicals producer based out of Montreal, announced recently at the G7 Environment, Energy and Oceans Ministerial Meeting in Halifax, Nova Scotia, that it will be exploring opportunities to take action on ocean plastics waste and marine litter. ‘If you don't recycle, we do it for you' is the motto of Wheeldon Brothers Ltd. This waste management company in Manchester/UK produces solid recovered fuels too. This is where a particular shredder with high output comes in: the Polaris 2800 one-step shredder from Lindner-Recyclingtech. ‘There is no better and more efficient machine for one-step shredding,' says Wheeldon. South Carolina-based RePower South (RPS) has reached an agreement with the City of Montgomery, Ala. to operate the City's state-of-the-art Materials Recovery Facility (MRF). RPS will invest $12 million in the newly named City of Montgomery Recycling and Recovery Facility. RePower South has partnered with Bulk Handling Systems (BHS) and Loesche Energy Systems to revamp the existing recycling system to also produce a low carbon renewable fuel that will be sold to industry, cement, and utility customers to replace coal in the production process. Lindner-Recyclingtech GmbH made several key new product introductions at this year's IFAT, held in May, in Munich, Germany, including the Polaris 1800 model, a specialized shredder designed for SRF (solid recovered fuel) applications, the Zeta Star 95 F2 starscreen for processing waste wood fuel, and the Atlas 5500, a new twin-shaft primary shredder with an innovative electric drive. Peterson Pacific Corp., has introduced the new Peterson 3310B drum chipper. "The new-3310B drum chipper is smaller and lighter than our previous model, but still packs impressive performance," said Jody Volner, President of Peterson Pacific Corp. "The 3310B can operate on even tighter landings for biomass and land clearing operations. We are excited about the capabilities of this remarkable machine." With China closing its doors to lower-grade recyclables, and with composting programs continuing to underperform, keeping wet organic waste, black bag waste, as well as MRF residuals material out of landfill is becoming an increasingly tough challenge. Now available in North America from Ecoverse Industries, the Doppstadt SM 617 Flex trommel is state-of-the-art screening technology with a high price-to-performance ratio, providing all the functions required for composting and organics recycling operations. The LFC from Power Knot is a biodigester that automatically converts solid food waste into drain-safe waste water. The operation is free of odour, slashes the costs for the disposal of waste, and greatly benefits the environment. Continuous bio-digestion allows food waste to be added at any time. The Topturn X-series is getting a new member. At IFAT 2018, taking place from May 14-18 in Munich, Germany, Komptech is presenting the Topturn X5000, a new self-propelled windrow turner that is ideal for the medium to high throughput range. Since introduced, the Topturn X4500 has proven itself as a starter machine for smaller compost facilities. The new Topturn X5000 model is the perfect machine for five metre-wide by two metre-tall windrows, as used at many larger facilities. If all of its performance potential is used to the fullest, the X5000 can turn up to 4,000 cubic metres of compost in an hour. Surrey, one of B.C. 's largest cities (south-east of Vancouver) officially opened a new Biofuel Facility March 9th, located in the city's Port Kells industrial area. The $68 million facility is the first fully integrated closed-loop organic waste management system in North America. The facility will convert curbside organic waste into renewable biofuel to fuel the City's fleet of natural gas powered waste collection and service vehicles. Under this closed loop system, waste collection trucks will literally be collecting their fuel source at curbside. Excess fuel will go to the new district energy system that heats and cools Surrey's City Centre. A consortium of companies comprising Air Liquide, AkzoNobel Specialty Chemicals, Montreal-based Enerkem and the Port of Rotterdam have signed a project development agreement covering initial investments in an advanced waste-to-chemistry facility in Rotterdam, Holland. The facility will be the first of its kind in Europe to provide a sustainable alternative solution for non-recyclable wastes, converting waste plastics and other mixed wastes into new raw materials. The EDGE TRT516 Trommel Screener is a screening solution ideal for mid-size operations with on-site space restrictions and for those operators who wish to regularly reposition their screen onsite. The TRT516 Track Trommel combines a robust durable machine with a quick and easy transport design. It is ideal for the processing of compost, topsoil, domestic household waste and construction and demolition waste. Enerkem Inc., a world leading waste-to-biofuels and renewable chemicals producer, announced at the end of January that it has signed an agreement with Sinobioway Group worth over C$125M in the form of equity investment in Enerkem Inc., future licenses, equipment manufacturing and sales, as well as for the creation of a major joint venture that will lead the construction of over 100 Enerkem state-of-the-art facilities in China by 2035. The announcement was made in the presence of the Premier of Quebec, Philippe Couillard, during his China trade mission. The Material Recovery Facility (MRF) provided by Machinex, as part of the Energy from Waste (EFW) plant for Levenseat Renewable Energy Limited in Lanark, Scotland, has been fully operational since the end of 2017. The 200,000 tonnes of commercial and industrial waste, along with all the municipal solid waste expected to be received each year will be diverted from landfill at a rate of 98 percent.